The lunar eclipse of July 27 is not very far and is fast approaching! This second eclipse of the year 2018 will be quite special because on the one hand, it will be the longest of the 21st century and on the other hand, it will be decorated with a red copper color, hence its nickname: the moon of blood. However, it is also important to emphasize the particularity of the energies that surround it because the most sensitive ones will probably feel them in an intense way. The lunar eclipse occurs when the Earth interposes between the Moon and the Sun, creating a shadow, thus preventing the sun's rays from reflecting on the surface of the Moon. This rather exceptional phenomenon will take place on July 27, 2018. The beauty of this eclipse will reside in its coppery color, which it will cover for more than an hour, because the Mars planet will also be aligned with the Earth, the Sun and the Moon. In France, it can be observed partially and totally and will last nearly 103 minutes. 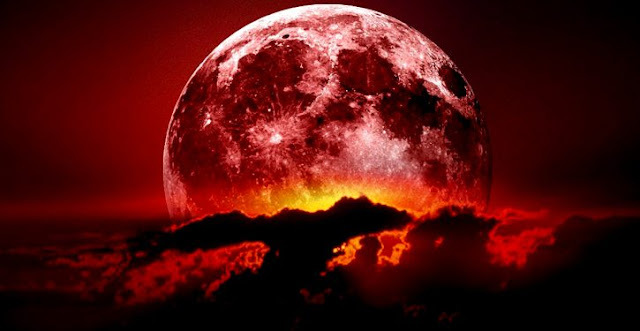 From 9:30 pm, we will be able to look up and admire the spectacle that will give us the beautiful red moon, during a long and generous period of about 1 hour and 42 minutes (Coordinated Universal Time or UTC), the longest lunar eclipse of the 21st century. And, it is the length of this eclipse which will constitute a major factor in the development of the energy which surrounds us, which will be more or less intense according to the sensitivity of each one. Negative feelings such as anxiety and mood swings will be there, highlighting the dark side of our personality, usually buried inside us. The full Moon of Blood will reinforce these emotions which will be at their culminating point. Most people will make rash and impulsive decisions or act strangely. This flow of energy will be a little difficult to manage, especially among the most emotional. Also, the combination of the full Moon with the total lunar eclipse will be confusing for the most vulnerable who will be facing the most difficult time of their lives. They will be led to recognize and expose the shadows and flaws of their personality. Fortunately, our qualities will also be highlighted and everyone can benefit from a real awareness of his way of being. For this reason, this period of the eclipse will be a boon to evolve towards a better version of ourselves. Thus, we will take advantage of the various energies of this lunar eclipse. All of our strengths and weaknesses will be put to the test, to overcome our faults and spiritually elevate ourselves, to grow and mature. This can lead to positive emotions such as pride, courage or self-esteem, but also negative emotions, such as anger, rage or feelings of unhappiness. Thus, with the lunar eclipse, it will result in a reset of our past emotions, especially those of the previous six months. How to deal with these energy changes? Thus, while some will feel fully at ease with these energy upheavals, others will need support because they will experience a real emotional roller coaster ride. Therefore, it will be important to control your behavior during this lunar phase, avoiding making decisions and acting impulsively. It will also be wise to keep calm and be cautious during these changes, but also the rest of the year. To do this, take a step back and take a deep breath, because in the end this is a good time to reach your goals and face your vulnerable side. In sum, this testing will be an opportunity to reveal our ability to withstand the toughest obstacles of our lives.